Top tips for learning audio/video recording. Indepenent reviews of guitars, strings, accessories and recording equipment. Want to learn more? Book a Skype lesson now, starting at 40€ / $45 per 60min lesson. Submit a question for a Q&A episode, tell me what you'd like to see next or share your story. 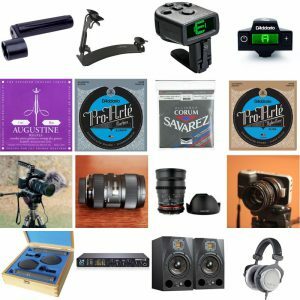 All of my favourite gear in one place - head over to my Gear page or Kit.com to read mini reviews of guitars and accessories I use, recording studio kits for every budget, my filmmaking gear and more. What are you most interested about? Let me know!